A glucose reading indicates the amount of glucose (sugar) in the bloodstream. The presence of glucose in the blood is natural, in fact necessary. Glucose is used in our cells as a source of energy, and may in fact be looked upon as the fuel which keeps is going. A blood glucose reading is used to determine if the amount of glucose in the blood is at a normal level. An elevated reading is a signal that something may be wrong. Normally, several readings will be taken to confirm that the elevated condition does indeed exists. Greater than normal amounts of glucose in the blood are very often an indicator of diabetes. 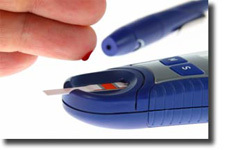 When you have a blood glucose reading taken, it needs to be under controlled conditions. The amount of glucose, or blood sugar, in our system, is not a constant, but will change throughout the course of a day. What we eat, and how much we eat, will influence blood sugar levels, as will exercise. One method of measuring blood sugar levels is by a fasting test. A fasting measurement is taken once a person has had nothing to eat or drink, except water, for a specific period of time, usually 12 hours. After that time a glucose reading of 110 mg/dl (milligrams per deciliter) or less, is considered normal. A reading of greater than 110 ml/dl indicates a possibility of a diabetic condition. A follow-on fasting test will normally be taken to confirm the findings. Other symptoms pointing to the possibility of diabetes will also need to be taken into account. A random, non-fasting, test can also be done. Here, a reading in the low 100's will generally be considered to be normal, while a reading of 200 or more indicates a problem. A third type of test involves drinking sugared water, taking a glucose reading shortly thereafter, followed by another reading some time later. In a healthy individual, the glucose reading should be high at first and then fall to normal at a later time. If the glucose level falls too slowly, a diabetic condition is suspected. The numbers cited are those generally used to define a normal glucose reading as opposed to an abnormal reading. A person's age and health may affect their reading, though not usually by a significant amount. If you were to eat a large lunch immediately preceding a random glucose test, the results might well be troubling, though likely invalid. In such a case, the glucose reading should not be ignored however, but a new reading should be taken at a different time to verify that an abnormally high reading was indeed an anomaly. In the event you have been diagnosed with diabetes, you'll of course be monitoring your blood sugar level frequently, and your glucose reading takes on added significance. In summary, this reading is an important indicator of a person's health and well being, and readings should always be taken under conditions that guarantee their validity.